Filing week is behind us, and while there is some talk of a special legislative session about addressing gun violence (an unlikely bet, I’d guess), many eyes are moving towards the elections. 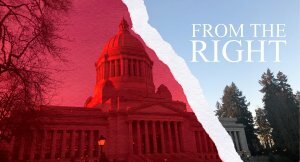 Thanks for reading our stuff as we try to highlight the politics, personalities and political economy of Washington State. Representative Mary Dye was recently selected to serve on the Washington State Women’s Commission established this year via HB 2759. We spoke with Rep. Dye about the primary goals of the commission as well as the unique perspective she brings to the table. As a legislator from rural Washington, Dye says her priorities will be to focus on economic opportunity and strengthening families. Friday marked the end of a busy 2018 filing week where 426 candidates filed for 158 statewide offices in Washington. Within that group, we saw Democrats (173) outnumber Republicans (156), and also noted a large group of Independent or no party preference candidates (37). The week also included several surprises, such as Susan Hutchison’s last-minute filing for U.S. Senator and Sen. Jan Angel’s retirement and candidate withdrawal. In another surprise, we noted that of the 78 candidates vying for U.S. Senator or U.S. Representative seats, only 16 are women. Here’s a rundown of some of the trends we saw and races we will be watching in the coming months. The Washington State Labor Council held its annual COPE Convention (Committee on Political Education) over the weekend, where it considered endorsements of candidates and initiatives heading to the fall ballot. Notably, they dual endorsed two Democrats in the 8th Congressional and are actively opposing embattled Democrat Rep. David Sawyer in the 29th. But the biggest news was what didn’t happen: the Labor Council failed to endorse the carbon tax initiative, I-1631. It garnered 60.2% of the delegate vote, falling short of the needed 2/3rds support. This year’s initiative was crafted, in part, specifically to garner labor backing. The proponent group is the Alliance for Jobs and Clean Energy, after all. SEIU, UFCW, and the Teamsters, among other labor groups, are committed to the initiative, regardless of the Labor Council vote. But, this is a set back for the initiative’s efforts to coalesce a broad progressive coalition heading into the fall. ﻿ Susan Hutchison, former Chair of the Washington State Republican Party, has filed to runfor the US Senate. She joins a crowded field of 29 candidates for Maria Cantwell’s seat. She sat down with us in this episode of “Wire Insider” back in December when she still was Party Chair. Hutchison has done a lot for the Washington State Republican Party, stabilizing it during difficult times in recent years. She has a following of party loyalists that appreciate her work. But, the late start and the connection to an unpopular president are likely difficult obstacles to overcome against an incumbent in a midterm. Last week, the State Supreme Court heard arguments on the long-running legal battle over the constitutionality of charter schools in Washington State. Following the legislature’s funding tweak to the 2012 charter school initiative, the King County Superior Court ruled charter schools to be constitutional. That decision was then appealed by a group of organizations including El Centro de la Raza and the Washington Education Association. During the hearing, arguments focused on school funding, local accountability, supervisory authority, and collective bargaining. After arguments were heard, hundreds of charter school students gathered on the steps of the capital to rally in support of their schools. A decision in this case is not expected to be reached for months. Last week, Governor Inslee spoke at the Center for American Progress’ Ideas Conference, an event that Politico describes as the 2020 Democratic field’s “first dry run.” Inslee offered a short speech and participated on a panel where his remarks focused on climate change and clean energy jobs. Other speakers at the event included Sens. Bernie Sanders, Elizabeth Warren, Cory Booker, and Kirsten Gillibrand. Adding more fuel to the rumor that Inslee is prepping for a 2020 presidential run, the Iowa Democratic Party released a media advisory yesterday announcing Inslee as their keynote speaker for their Hall of Fame Celebration next month. Inslee’s spokespeople have downplayed the idea that this relates to a presidential run. Instead, they say the invitation is simply related to Inslee’s role as Chair of the Democratic Governors Association. The Washington Policy Center is hosting its two half-day policy conferences this week. The Western Washington Solutions Summit is happening today in Bellevue, and the Eastern Washington Solutions Summit is tomorrow in Spokane. 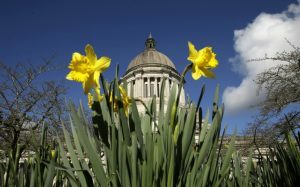 Today’s agenda features sessions on the Seattle head tax, charter schools, carbon tax efforts and the Janus v. AFSCME case. Tomorrow’s agenda also includes an update on the 2018 Farm Bill. We have three reporters at the event in Bellevue today covering the conversation, which we’ll bring to you over the course of the week. If you’re signed up for our Daily Wire, you’ll get those stories the day they post.